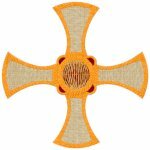 Machine embroidery designs of the Christian Cross. Browse 100's of contemporary, vintage, classic and rare embroidery designs of the Cross, all manually digitized for professional results. Embroider with the confidence that you will be creating beautiful and stunning church and religious embroideries.